N. and I went to Meridian Pint again last night with a couple friends and I am happy to say that we greatly enjoyed our food this time, and the service and overall experience was excellent again. I had the steak, and I have to say, it was a damn good steak. As I mentioned before, I'm always a little skeptical about a steak, especially something like a New York Strip, from a restaurant that isn't a steakhouse. Meridian Pint did a bang up job. I ordered it medium rare, and it was perfectly cooked, barely warm in the middle, juicy and delicious. The sauce it was served with was subtle and did not overwhelm or conflict with the natural flavor of the beef. The mashed potatoes and spinach were also very tasty. At $21 it's actually a pretty damn good deal for a steak! N. had the grilled trout, and loved it as well. Cooked perfectly. Out guests had the double-cut pork and the burger respectively. I didn't try either but they both raved about them. So I'll chalk my first experience up to either opening day, or maybe the beef rib sandwich just isn't a winner, but for last night's return visit everything was great. I still think the menu could use a little fleshing out for carnivores, but there's no question that the chef knows what he's doing and the food was delicious. We also took a look at the basement area last night, which we did not on our first visit. What a cool bar room. This is where the famous table taps can be found, as well as a long bar and two pool tables. The space is dark, cozy and sure to be a hit - a welcome addition to the watering holes that we already have in columbia heights, and having a couple pool tables down the street rocks! Cheers to Meridian Pint - I expect to be a regular customer. N. and I decided to embrace the glorious weather last Thursday with a ride on Merdian Pint's inaugural cruise. We've been watching the slow progress for what seems like an eternity now, and it's wonderful to see the place has finally opened it's doors for business. The restaurant, which replaced the abanonded Bi-Rite Supermarket that was an icon of times past, is more than just another eating option. 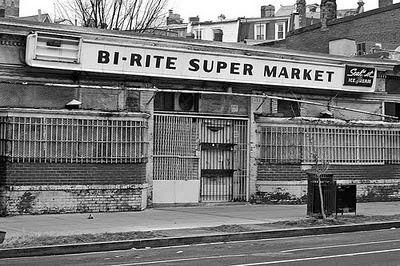 It's symbolic of the transformation of the 11th Street commercial corridor, which has been slow to evolve even as downtown Columbia Heights has turned on its head in just a few short years. The last significant opening on the block anchored by Wonderland was Red Rocks, across from Meridian Pint at 11th and Park. Red Rocks was the pioneer of this important yet languishing commercial strip. But despite their success and endearment to the neighborhood, there were few followers in the nearly three years since their opening. The space is great. The front of the restaurant is flanked by two roll-up garage doors that create an indoor-yet-outdoor dining experience. It's got a mix of tables, high-top, booths and bar seating. This is surrounded by blonde hardwood floors, what looks like a tin or replica tin ceiling over the bar, paneling around the bar area, and beige-painted walls. The overall effect is a little conflicted style-wise but very inviting. It's warm, airy, and doesn't feel too crowded, even as a dozen people milled around in the entrance area. Our service was good. Actually, considering it was their first day, it was excellent. We started with chicken wings which I thought were pretty good and N. was less enthusiastic about. Bear in mind, though, that I make the BEST DAMN chicken wings in Columbia Heights, if not the free world, so there is a very high bar to reach for there. We both seemed to have a little trouble choosing our entrees, and where we landed was a bit rough. I had the beef rib sandwich, which came topped with a purple cole slaw and no sauce of any kind. Unfortunately, it was entirely bland. I actually put ketchup on it. I am not sure if it was supposed to have come with some sauce, but it was pretty flavorless. N. had the salmon salad with curried lemon yogurt dressing. The curry flavor was overwhelming to the point where you could taste little else. It was just kind of weird. Perhaps we just didn't like the salad, but the sandwich was unquestionably missing something. Overall, I think the menu is a little tricky for me because I'm not a vegetarian, and it has a strong bent towards crunchy-friendly items. Among the ten entrees, three are vegetarian, two are fish, one is roasted chicken (who gets chicken at a restaurant? ), and one (turkey and potato hash) is entirely unappealing to me. That last one sounds like something you would get at the end of the food drop cycle in an Iraq military base. The remaining menu items are a steak, a pork chop, and short ribs. I have no problem with any of these, though steaks outside of steak houses can be risky. I suspect these three items are where I'll end up most of the time. Though I am not adverse to fish and chips once in a while either... I just wasn't up for the fried fest when we were there. On the sandwich side, there's also not much that grabs me. The rib sandwich I had looked the most interesting. I'm not likely to order a $10 half-smoke when I go out to eat, and everything else is either veggie/wierd (soy smoke??) or boring (chicken salad sandwich and a hamburger). I don't want this to be taken as overly negative, because I made one visit and we had a couple things, none of them entrees, that were less than stellar. But everything else about the experience was good. My overall criticism has mostly to do with the fact that I didn't click with the menu, than with one beef rib sandwich that needs some help. I think expanding the sandwich options to include a couple more items that are NOT a hot dog, veggie, or a hamburger would solve the problem at that end. For the entrees, it would be nice to include a couple of interesting non-veggie, non-fish options. If you're a meat eater and you aren't feeling the fish, and you write off the chicken from the get-go as many do, the choices you're left with just don't seem that interesting. I think this could easily be corrected by just adding one or two more items. I am looking forward to returning and trying these some of the other items that actually DO grab me when I return, actually, tomorrow. We have plans for dinner with a couple friends... and we're going EARLY since it's supposedly been packed every night since opening. Other reports I have been hearing and reading about the food seem mostly positive, too. So I'm optimistic, even if my first experience was not earthshaking. The prices generally seem about right, too, so at the end of the day, I really only need to love a couple things on the menu to make it a regular stop for me. Tweaking the menu just a little would make a big difference, though, in terms of making the selection feel less constrained for carnivores. I am sure that it will evolve in time like any new restaurant. Oh yeah, the beer: I loved my Founders Red's Rye IPA! The tap beer selection is awesome and they also have some decent wines by the glass. Don't change a thing here, the drinks are a win. I'm planning on checking this place this weekend. The GF is a vegetarian, so the food should be fine for her, and I like beer more than wine so this may bump Room 11 down a notch if the table-top taps live up to the hype. It's a good place. A personal rule is I stay away from food for the first few weeks of any new restaurant... it takes a little time to get it ironed out. The table top taps are a huge gimmick, but whatever, it will draw people in and help them thrive. Great beer selection.